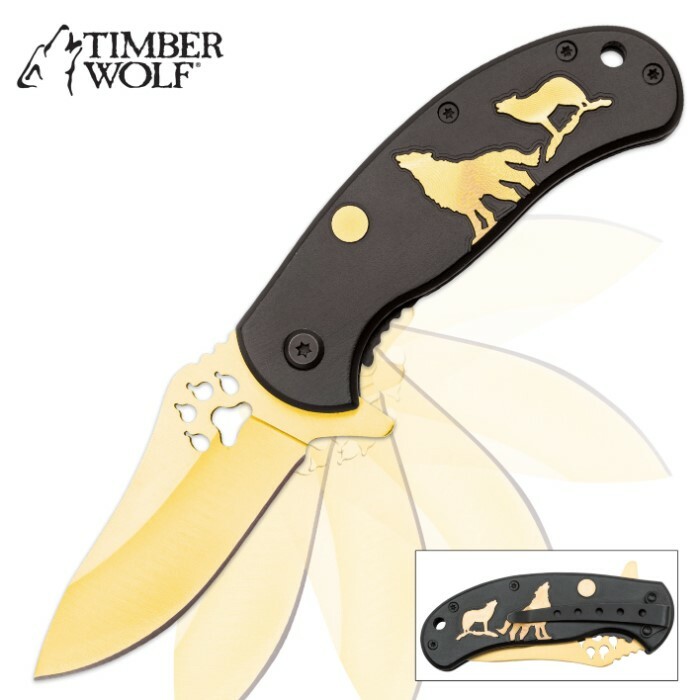 Timber Wolf Pack Leader Gold Bladed Assisted Opening Pocket Knife | BUDK.com - Knives & Swords At The Lowest Prices! 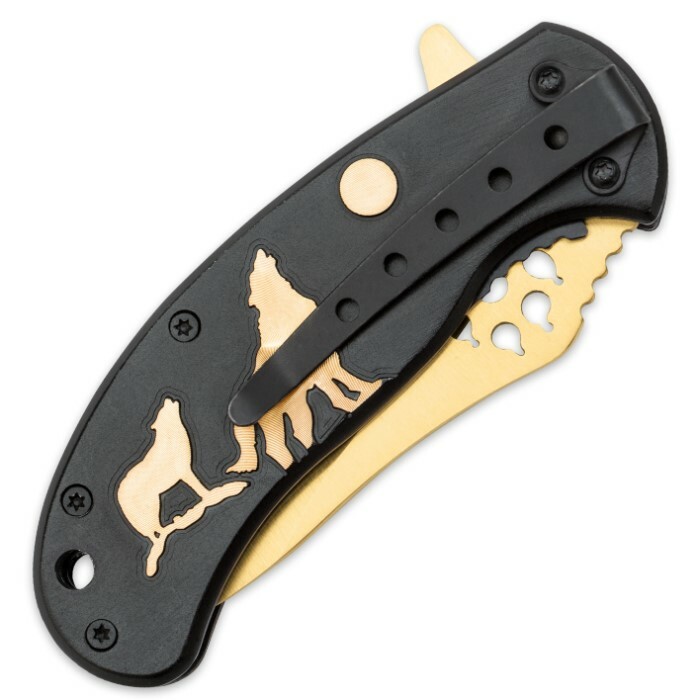 Timber Wolf has unleashed the ultimate "Pack Leader" with this assisted opening pocket knife. It features an aluminum handle with a smooth black finish and a gold coated silhouette of two wolves howling under a full moon. 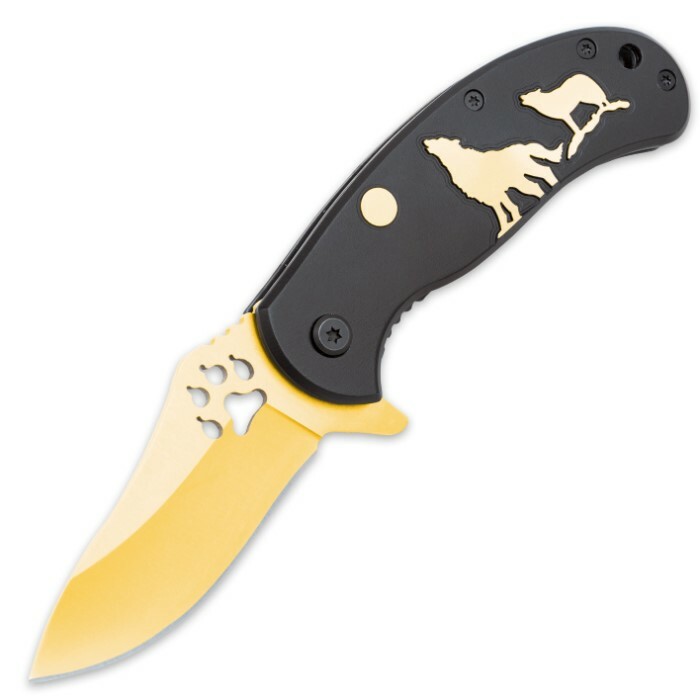 The razor sharp 3" AUS-6 stainless steel blade is gold coated for superior performance and appearance, and includes a snazzy paw print cutout. It opens effortlessly; just a touch of the flipper and it flies open at impressive speed, thanks to the advanced assisted opening mechanism. At 3 3/4" closed it's easy to carry, especially with the integrated pocket clip and lanyard hole. This knife looks good. It doesn't come sharp,but for the price it's okay. This knife is perfect for anyone who wants a showier knife but still wants it to be useful. I adore this knife and carry it often. The blade comes fairly sharp and the assist is really fast. The wolves on the handle are beautiful and the blade cut out is eye catching and unique. When open the knife is very comfortable to hold and the blade spur makes an excellent guard. Overall the best knife I've bought here and for an excellent price. This is a beautiful knife. Elegant looking. Nice size for a pocket knife and pretty sharp blade. This is a beautiful assisted open knife. Bought it for my brother but my buy one for myself. You should do the same!